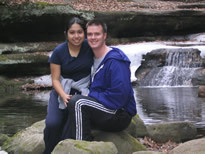 Monica and Scott first met at Horace Mann Middle School in the fall of 1999. Scott was teaching 6th grade Social Studies, and Monica was beginning her student teaching--with Scott as the cooperating teacher! While nothing happened during the student-teacher part of their relationship, they quickly hit it off and became friends. After Monica graduated in December of 1999, she was offered a teaching position at Horace Mann. It seemed that fate had thrown Scott and Monica together. Over the next year, their friendship grew, and they eventually ended up dating. 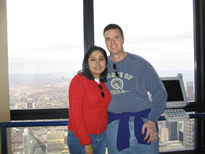 They quickly realized they were meant for each other, and when Scott decided to move to Chicago after the 2000-2001 school year, Monica made the committment to come with him. As with their teaching careers, the rest is history!